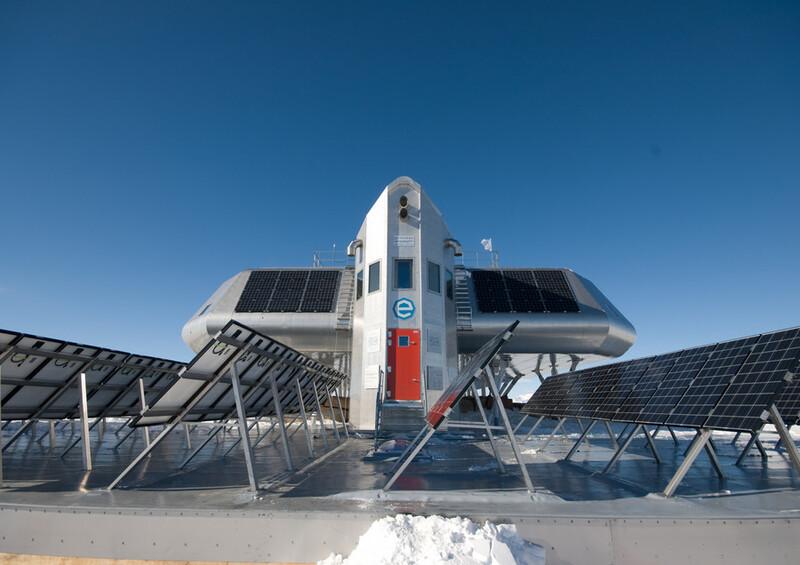 Perched on a nunatuk, 200km from the coast, at an altitude of 1400m, the aerodynamic stainless steel structure can withstand strong Antarctic wind, and is layered so that no form of interior heating is needed. The station seamlessly integrates renewable wind and solar energy, water treatment facilities, passive building technologies and a smart grid for maximising energy efficiency. Antarctica is Earth’s southernmost continent. It contains the geographic South Pole and is situated in the Antarctic region of the Southern Hemisphere, almost entirely south of the Antarctic Circle, and is surrounded by the Southern Ocean. At 14,000,000 square kilometres (5,400,000 square miles), it is the fifth-largest continent. For comparison, the continent is nearly twice the size of Australia. About 98% of the continent is covered by ice that averages 1.9 km (1.2 mi; 6,200 ft) in thickness, which extends to all but the northernmost reaches of the Antarctic Peninsula.